Hazelnut is a very tasty nut, has a wonderful sweet nutty flavor. Unfortunately, its skin is bitter a little, and it tastes much better without it. 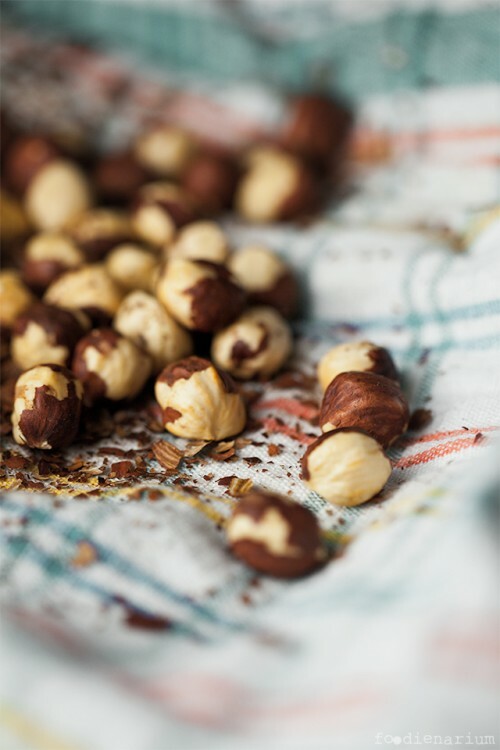 In most recipes it’s better to use hazelnuts without skin from the point of view of both taste and aesthetics. Fortunately, if you have an oven, removing the skin won’t be a problem. You just need to heat the oven to 190 degrees (no fan), put the hazelnuts onto a baking tray and leave in the oven for 10 minutes. The only thing needed is not to overdo it and not to start roasting. Then you need to put the hazelnuts into a kitchen towel, tightly wrap and leave for 20 minutes to cool down. Then you just need to rub the hazelnuts in the towel and almost all skin removes itself. Good luck!